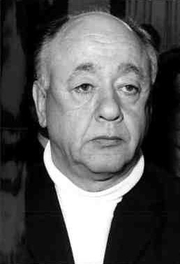 Educated in Bucharest and France, Ionesco was a foremost playwright of the "theatre of the absurd". His plays include "Rhinocéros" (1959), "Le Roi se meurt" ("The King is Dying" - usually performed in English as "Exit the King" (1962). Eugène Ionesco is currently considered a "single author." If one or more works are by a distinct, homonymous authors, go ahead and split the author. Eugène Ionesco is composed of 19 names. You can examine and separate out names.